1. Why are eating disorders so dangerous? Eating disorders are a misuse of food to resolve emotional problems. Behind every eating problem there is an emotional issue yet to be discovered; behind every “fat” thought, there is another thought, needing to be discovered. The most lethal of all the mental health disorders, eating disorders kill 13 to 20 percent of their victims, 90 percent of whom are kids under the age of 20. Eating disorders are pervasive, crossing all cultural and socio-economic lines, and afflicting an increasing number of men and boys and younger children. They are insidious, hardly appearing to look like pathology, but instead resembling self-discipline and self-control. When parents are knowledgeable about eating disorders, their child’s needs, and their role as parents, when they are not afraid to become involved with their child in a proactive way, eating disorders are preventable. The best news is that eating disorders are curable in 80 percent of cases where parents can detect disease in their child early and engage in the most effective treatment for both child and family. 2. Why are body image concerns so dangerous? Body image concerns can lead to disordered eating, and otherwise “benign experimentation” with dysfunctional eating behaviors such as occasional purging or dieting, etc. These behaviors put a child at high risk for developing an eating disorder. If a parent sees such behaviors in their child, it may indicate that their child is on a slippery slope. Body image concerns are a natural part of growing up today, particularly with youngsters reaching puberty at an early age. 3. What makes eating disorders so difficult to identify? Though eating disorders are diseases, and lethal ones at that, many of the behaviors that distinguish them fall into the realm of normalcy. Everybody is on a diet of one sort or another these days…and typically, people feel appreciated and validated for dieting behaviors that seem to be indicators of self-discipline and self-care. 4. Why do some kids get eating disorders and others do not? 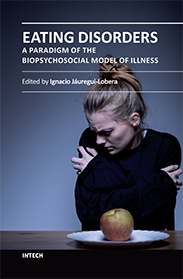 There is evidence that the causal roots of eating disorders lie in genetics and temperament. But not all kids with genetic predispositions will become eating disordered, either. For an eating disorder to develop, genetic tendencies must be combined with or triggered by environmental factors as well. Parents do a great deal to shape a child’s attitudes towards food. 5. Are parents the cause of their child’s eating disorder? That parents shape a child’s food attitudes does NOT mean that parents are responsible for causing their child’s eating disorder. Though they are not the cause of their child’s disease, there is a great deal they can do to PREVENT or to HEAL these diseases in their child. Parents who do not understand eating disorders or their implications for their child may inadvertently trigger an eating disorder in a genetically susceptible child, despite their intentions otherwise. Their task is to learn how to become involved in the process appropriately and constructively. Eating dysfunction is a warning light flashing; it is for parents to help the child recognize and define the problem, so it can be resolved. 6. Why do parents need to step in when they see a problem? A child’s malnourished brain is incapable of accurate perceptions, and renders the child incapable of making sound judgments and assuming responsibility for self-care. The eating disordered child virtually gives herself over to the disease. As much as 80 percent of a child’s thought can be taken up by food obsessions and calculations, leaving the mind unavailable for learning. In a recent study, eating disordered children said that they feared becoming fat more than they feared losing their parents, getting cancer, or experiencing a nuclear holocaust. 7. What should parents do? Parents should intervene, not with the intention of taking control of the child or her food, but of taking charge of the situation only until such time as the child becomes capable of resuming some degree of self-control. Teens need appropriate and knowledgeable input from their parents as much as infants do. And if parents are not forthcoming, the child becomes more susceptible to the negative influences of peers and the media. Nature abhors a vacuum. The role that the parent plays will vary based on the parent’s emotional facility, the child’s age and developmental life stage, the nature of the parent/child connection, and the particular stage of treatment and recovery progress. Their role will change during the course of the child’s recovery; the parent must learn to modify the nature of his or her support according to the changing needs of the child. When the entire family can support child’s recovery or be involved in the child’s changes, the child is liable to make the timeliest, most effective, and lasting changes. 8. What kind of intervention is appropriate intervention? Parents need to find a way to bring themselves closer to the child so that the child is brought closer to cure. Parents need to communicate their concern for the child; the parent’s intention is to support, not to control food or the child. Parents need to learn to listen between the lines to the feeling and emotions that underlie words and behaviors. Communications go two ways. Where the child’s communication is not forthcoming, (resisting acknowledgement of disease or need for help), parents need to initiate the dialogue. Remaining true to oneself and one’s child, it is important to be fully honest and self-disclosing, allowing reality to dictate the direction and course of conversation. 9. Is it okay for parents to talk about food with their child? Okay? It is necessary! Parents must talk about the healthy use of food, healthy eating, what it entails and means for the body. Kids need to know the purpose and intention of eating healthfully; they need to put healthy and regular meals and good nutrition within a meaningful context. Kids are not born spontaneously competent. They need information. Parents must also be aware of the unintentional inadvertent messages they communicate. For instance, parents who encourage their kids to read nutritional labels may ultimately inspire food phobias, or the idea that food is fattening, and “ the enemy.” Parents, too, may not fully understand what healthy eating is, for themselves or their child. 10. What can we learn from the proliferation of Pro-Anorexic websites? Kids with eating disorders, feeling confused, frightened and alone, seek connection to others from their vantage point of isolation. Many don’t know they are sick, that they need help, or what kind of help they need. Some believe that anorexia knows no cure. Their need to segregate themselves from non-eating disordered folks is significant in that they assume and fear that no one will understand, that they cannot be helped, or that others might try to get them to recover; many eating disordered kids fear that they will not have the emotional wherewithal to go on living without their disorder. 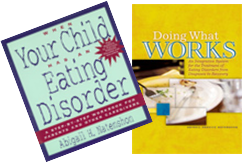 Children with eating disorders wish to survive in whatever ways they can. These sites provide the only way they know at the time. It is up to parents and professionals to show them another way. Even the most pernicious outside influences have a better chance of falling on deaf ears when good values are planted firmly in place through home life. Parents must learn to address food issues before they become problems, to intervene in problems before they become serious, ingrained, or habitual, to address body image concerns before they become body image distortions and preoccupations. Parents must arrive at their goals with their child related to food and eating by addressing the whole child. Don’t be afraid; of the child, the eating disorder, of taking a stand, of conflict, or arousing child’s anger or displeasure. Anticipate it, be prepared, handle it. Look at own attitudes around food. Don’t skip breakfast, have a donut and coffee at 10:30 and confess you are about to sin before ordering a dessert!